I've been experimenting with half a dozen different flavors of these tiny square bites of perfection. If you caught my first recipe using the square silicon molds for delicious clean treats, you'll know how amazing these are. If not, check it out here. A week or so ago, I tried the Carrot Ginger version that was a ht with the test group. I like to try a recipe at least twice, so I made another batch for July 4th celebrations at my parents. It was a huge hit! The recipe takes time, more waiting time than cooking time, so be patient. The nice thing about it, is you can make the base and top in the morning then finish the middle in the afternoon so you are ready for dessert after dinner. They keep in the fridge or freezer in their molds for up to 10 days, or you can transfer them to a freezer bag or container with lid for long term freezer storage. Do you workout? These babies are perfect for a pre-WOD bite. Small easy to eat, high in good fat, low in carbs. Make ahead, store in the fridge or freezer and bring one on the go to your workout. They thaw quickly (in minutes). 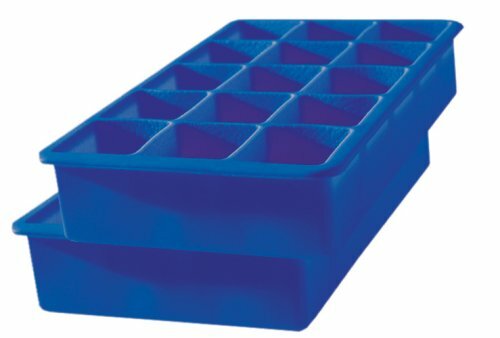 TIP: I used this Tovolo Cube Trays. Actually, I have them in three different sizes and am obsessed. I highly suggest them, or some other silicon tray for any of these bite size recipes. This recipe makes 12 1.5" cubes, or 1 tray. Shred carrots. Rough chop ginger and dates. In a sauce pan, heat butter, coconut oil and coconut butter over medium-low heat stirring constantly. Once it's melted, add carrots, turmeric, cinnamon, salt and inside of vanilla bean. Sauté for 5 minutes. Add ginger and dates, sauté for another 3 minutes. In a food processor, add macadamia nuts and pour in mixture from sauce pan. Mix on high until almost smooth, 3-5 minutes. Pour into silicon molds filling each square about half way. Store in fridge for at least 30 minutes, up to 24 hours. Mini Carrot Ginger Bites. The first go round with a round silicon mold. In a food processor, add strawberries cut into halves. In a sauce pan, melt coconut oil and coconut butter together. Add dates and ginger and heat for 2-3 minutes. Pour into food processor and mix on high until almost smooth. Fill cubes evenly with mixture. Refrigerate for 2 hours. NOTE: For shorter prep time, store in freezer for 30 minutes. In a small pot, whisk eggs over medium low heat for 30 seconds. Pour in zest and honey. Whisk constantly until the mixture becomes a light yellow color. Be patient, this takes about 10 minutes. If the liquid begins to bubble, turn heat down. You will have chunks, but they will strain out at the end. Once it has turned light yellow, pour in lemon juice and continue to whisk. Add butter and/or oil 1 TBS at a time whisking continually. Strain and refrigerate in a small container with a lid for at least 1 hour. Once the squares are totally cooled and hardened, push them out of the molds and onto a plate. Using a small knife, spread lemon curd over the top. Add some strawberries or candied ginger for decor and serve! TIP: If you are eating this on the go, place 1 bite into a small container and add a small amount of lemon curd with it. I've carried this in my insulated lunch box for 8 hours and still ended the day with a delicious healthy pre-WOD treat!